Before starting this review I wanted to take a quick glance at how many albums Erik has put out over the years in relation to his latest one on Projekt Records. Sometimes an artist’s name is so familiar that you think you have a grasp of their discography and how long they have been working at making music in a particular genre. I pulled up his works at the website Discogs and realized that Erik has been composing his wonderful music since before I even started to listen to the genre that is the namesake of this website. Erik’s music goes all the way back to 1983 with an appropriately named album called Where It All Begins and truly that was the beginning of a musical journey for Erik that has lasted for the last 35 years. It wasn’t until 1998 that I first heard Erik’s music when I got a copy of Guitar Nova and realized that his music should be on AV’s radar from that moment on. Threshold Point is the 39th album that Erik has either put out himself or has appeared on in conjunction with other artists to create joint releases like he did with Earth Luminous with Byron Metcalf or more recently Meridian in which he collaborated with UK artist Ian Boddy. Suffice it to say that his career has been both prolific and brilliant as his music has continually evolved into what we find on Threshold Point which is perhaps Erik’s own estimation of his growth as an artist. To cross a threshold is to enter into new areas from wherever you were before you crossed that gateway. The Cambridge Dictionary defines threshold thusly “at the start of a new and important time or development, or the level or point at which you start to experience something or at which something starts to happen”. Some of the music you will find on Threshold Point was written at a very difficult time in Erik’s life as he was spending time with his sister before she tragically passed away and some of the music you will hear on this new album does capture those feelings of loss and Erik’s reflections on his emotions about a life that was too soon gone and one that would be sorely missed. The music is infused with these emotions and listeners will discern the introspective and pensive nature of the music that has been captured on this album. Like a photographer who preserves slices of life on film or on digital media to look at and remember certain periods of time in their lives so Erik composed and wrote some of these pieces while he was with his sister and they will forever encapsulate those difficult times in which they were written. Some of the music such as the Mosaic of Time pieces are like the personal acceptance of the inevitable march of time in our lives and as I look at the sub titles it looks more like a journey that Erik was on and that we take with him through his music. Route Diverge, Threshold Point, Hidden Path, Bridge Crossing. I have spent much time listening to the music that is contained on Threshold Point and it has been an insightful experience but not one that buries itself in depression or in darkness but one that embraces the concept of change and growth that happens when we simply step across the threshold into the next chapter of each of our lives. Granted there may not always be a choice as to whether or not we feel we are ready to walk across the threshold into that change but when the time comes perhaps each of will find the courage to take those steps and embrace whatever comes next. The music on Threshold Point is cathartic and as you work your way through the Mosaic of Time suite you will sense that by the time you reach Part IV called Bridge Crossing that the mood has become more ethereal as if the crossing of the bridge or the crossing of the threshold has been accomplished and that there is comfort in taking that next step. The Mosaic of Time suite has a pulsating and even a mesmerizing feel to it that allows the listener to drift with the rhythms and to let go of themselves and allow the music to take them where it will. Bridge Crossing is a fitting song to close out the album and the journey on which we walked with Erik on throughout this album. Other songs on the album such as Behind the Clouds, Ravel Peak, Arches or even Eon create a more atmospheric soundscape that embodies some of the intimate and fragile aspects of dealing with the passing of a loved one. Erik is a highly talented musician and his ability to channel the pain of his personal loss into his music which can then be shared with others is a way to speak to those who want to know how he is doing. Perhaps musicians keep musical journals instead of journals composed of words that act as reminders of those points in their lives that are beyond language but can be captured using music and emotion. 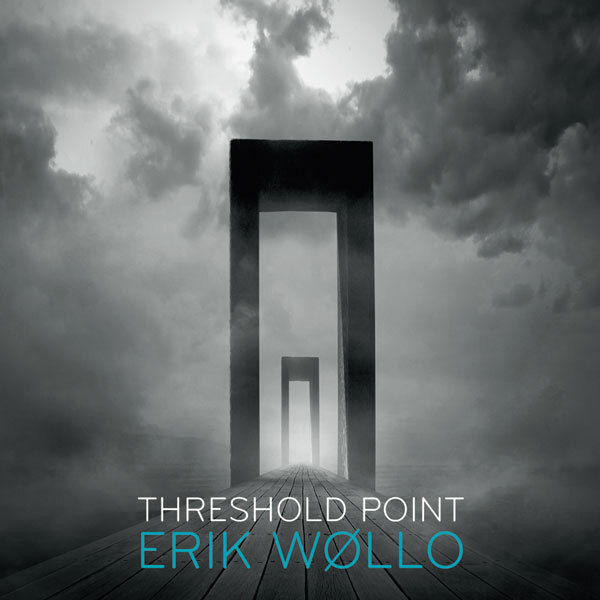 Erik’s new album Threshold Point has stripped away and laid bare some intense emotions for listeners to absorb and to perhaps find resonance within their own painful experiences and in the end in some way share Erik’s emotions blended with those similar experiences in each of their lives. Erik’s musical sensibilities are on full display on this new album and he does not disappoint as he weaves and paints these emotional songs on soundscapes that are skillfully created and layered so as to always reflect the circumstances under which they were composed. Sometimes words simply get in the way of communicating ideas and concepts that can only be expressed via music. Listen to Erik’s thoughts communicated via his music and simply understand at a level that is deeper than any words will ever be able to say. Adding this album to your collection would be something you would not regret. Highly recommended by Ambient Visions.